Inside February’s issue of European Baseball Magazine East meets west in Finland and France while Mister-Baseball.com covers the WBC. You’ll find coverage of the latest European baseball news, meet another ELB opening day squad and learn how baseball is saving lives in Nepal. This month’s Life Of brings you inside the world of umpiring. Entrepreneurs and Olympic hopefuls are expanding our behind-the-scenes understanding and so much more. Download now to start reading. 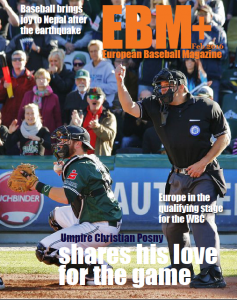 EBM+ is the first mobile baseball magazine in Europe. Once a month it offers you the hottest European baseball topics — reportage, player profiles, team news, events and much more. EBM+ is for all those who want to know what is going on in the E uropean baseball fields. The magazine is in English. Available on App Store, Google Play and in PDF-format. Go to https://ebmplus.one/webshop.ehtml and get your magazine.